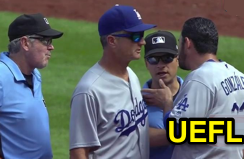 HP Umpire Marty Foster ejected Dodgers 1B Adrian Gonzalez (strike three call) and C Yasmani Grandal (strike one call) in the top of the 9th inning of the Dodgers-Cardinals game. With none out and none on, Gonzalez took a 3-2 fastball from Cardinals pitcher Seung Hwan Oh for a called third strike. Replays indicate the pitch was located off the outer edge of home plate and thigh high (px -1.013, pz 2.935), the call was incorrect. With one out and one on, Grandal took a 1-0 fastball from Cardinals pitcher Seung Hwan Oh for a called first strike. Replays indicate the pitch was located off the outer edge of home plate and waist-high (px -1.056, pz 3.118), the call was incorrect. At the time of both ejections, the Cardinals were leading, 2-0. The Cardinals ultimately won the contest, 2-0. This is Marty Foster (60)'s first, second ejection of the 2017 MLB regular season. Crew Chief Mike Winters now has 1 point in Crew Division (1 Previous + 0 Incorrect Call = 1). *UEFL Rule 6-2-b-1 (Kulpa Rule): |0| < STRIKE < |.748| < BORDERLINE < |.914| < BALL. This is the 58th, 59th ejection report of 2017. This is the 22nd player ejection of 2017. Prior to ejection, Gonzalez was 0-4 (2 SO) in the contest. This is the 23rd player ejection of 2017. Prior to ejection, Grandal was 0-1 (SO) in the contest. This is LA's 4th/5th ejection of 2017, 1st in the NL West (LAD 5; COL, SD, SF 1; ARI 0). This is Adrian Gonzalez's first ejection since June 29, 2016 (Dan Bellino; QOC = Y [Check Swing]). 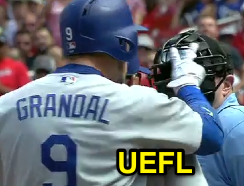 This is Yasmani Grandal's first career MLB ejection. This is Marty Foster's first ejection since September 20, 2016 (Danny Valencia; QOC = N [Balls/Strikes]). Wrap: Los Angeles Dodgers vs. St. Louis Cardinals, 6/1/17 | Video via "Read More"